Once you are done with all your makeup, brushing your lashes with some mascara adds drama to your look- makes your lashes appear thicker, darker and more defined. However, if not done correctly, it can make your lashes look clumpy and artificial and make your eyes pop out. In this post, I tell you how to apply mascara without clumping it up. First things first, invest in the right product. You don’t want clumpy looking eyelashes or your mascara bleeding out in the middle of the day. Invest in good mascara from a reputed brand that is waterproof and smudge proof. Preferably, pick one that guarantees volume addition to your lashes. Use an eyelash curler and gently work from root to tip to curl your eyelashes. If you do not have a curler, then use an eyelash brush to brush your lashes outwards. Now open the mascara tube and remove excess mascara from the brush. Get yourself in front of the mirror, get adequate light/ sunlight. 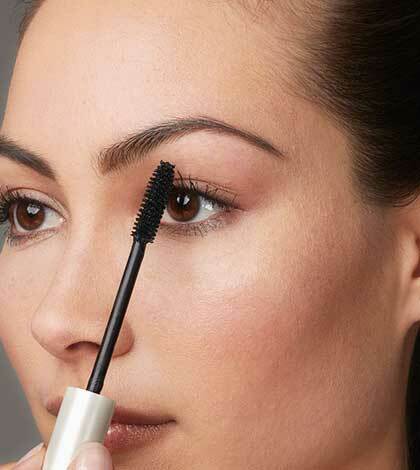 Work the mascara wand from the root to the tip of the eyelashes. With the wand rooted in the base of your lashes, do a couple of horizontal strokes to make sure you take excess product off. Repeat this until you get the thickness that you want. Now, with an eyelash comb, brush your lashes upwards- this will pull out excess mascara and also give your lashes a clean combed look and open your eyes out. Do not repeat the same thing on the lower lid. Strokes along the lower lashes from root to tip will cause your eyes to appear like they are bulging out. Instead, what you need is only for the roots of the lower lashes to be highlighted. Tilt your head forward to avoid the product from sticking onto your skin. All you have to do is to keep the mascara brush parallel to your nose and run the tip of the wand along the length of the lower eyelid, ensuring that you touch the roots of the lower lashes. Next, keep the wand perpendicular to the nose and again run it along the length of the lower lid, touching upon the lashes on the lower lid. This will highlight the eyelashes. If you have big eyes, then it is preferable to not do anything on the lower lid other than highlighting it with some kohl. Doing this will add drama to your eyes and highlight them really well. If you want to keep it subtle, go for a single stroke of mascara on both lids. If you are not careful, mascara can stick to your upper and lower lid while applying it. To prevent this from happening, keep a visiting card or a piece of paper beneath your lashes before you apply the mascara. After applying mascara on both eyes, when your wand is relatively dried up, you can use it to brush and highlight your eyebrows too. Once opened, the shelf life of mascara is only three months. So once you have opened a tube, use it regularly to get those bright and bold eyes! Did You Know These Uses Of Apple Cider Vinegar For Skin Lightening?